As a way of wishing Bill Heroman a happy birthday, this post will focus on a topic that he has discussed at length, namely the so-called “Great Man Theory.” I’ve chosen to combine the perspectives of Heroman and Markschies, because I think they approach the topic from two fascinating angles. Neither wishes to defend this rightly discredited theory of course but rather to enable us to think about it more precisely. In short, Heroman unpacks its mnemonic advantages, while Markschies shows how its emphasis on the role played by talented individuals contains an element of truth when considered in relation to the dynamics of institutionalization. Let me give a sense of each of their contributions by including several key quotations from Heroman’s multi-part blog series on “Heroic Histories” (see 1, 2, 3, 4, 5, 6, recap of 1-6, 7) and a single quotation from Markschies’s book Christian Theology and its Institutions in the Early Roman Empire. Heroic Histories, 1: From a reception standpoint, therefore, while the so-called “great man theory” (henceforth a.k.a. “the hero-centered view of history”, or “the hero-driven theory of history”, or for short perhaps just “heroic history”) remains impossible to defend as either objective or accurate, it has nevertheless gone deeply under-appreciated by professional historians, who should at least feel duty-bound to explain its perennial appeal. Most importantly, we may have all overlooked the mnemonic advantages heroic histories provide in their oversimplifications. Heroic Histories, 6: The primary advantage of Biography, for delivering rememberable story-structure, is that the ultimate human contingencies (birth & death) guarantee the reader a stable continuity in discourse, with both consistent orientation on a single subject (stable content) and an implicitly overarching chronological timeline (stable structure). That’s why a comprehensive life story’s fabula/discourse dynamic is unique among narrative genres and styles. Heroic Histories Recap: So far, this series has made two major points. First, Heroic History is a common literary tactic because it offers significant mnemonic advantages for remembering the past. But second – and perhaps more importantly – Plot isn’t everything. Memorable stories also cohere strongly around Character. CTaiI (p. 26): Thus, when the term “Institution” is used to consider not only the hierarchically structured majority church but first and foremost all social structures that establish stability and duration, then the focus on the “great men”—which characterizes the traditional writing of church history and is [often] so problematic from an epistemic methodological perspective—obtains a good sense as well: institutionalization can only succeed when, in addition to a new idea, there are also “talented individuals” who endeavor to obtain a social basis for its establishment. Whether we know all these individuals and whether they were only male is naturally a completely different question that is also difficult to answer for the second and third centuries. KCTuiI (p. 37): Wenn also mit dem Terminus “Institution” hier nicht nur die hierarchisch strukturierte christliche Mehrheitskirche in den Blick genommen werden soll, sondern zunächst einmal alle sozialen Gebilde, die Stabilität und Dauer etablieren, dann bekommt auch der wissenschaftsmethodisch oft so problematische Blick auf die “großen Männer”, der traditionelle Kirchengeschichtsschreibung prägt, einen guten Sinn: Institutionaliserung kann ja nur gelingen, wenn es neben einer neuen Idee auch “talentierte Individuen” gibt, die sich um eine soziale Basis zu ihrer Durchsetzung bemühen. Ob wir alle diese Individuen kennen und ob es nur Männer waren, ist natürlich eine ganz andere Frage, die für das zweite und dritte Jahrhundert auch nur sehr schwer beantwortet werden kann. Like my post on Francis Watson, Jens Schröter, and the Sayings Collection Genre of the Gospel of Thomas, today’s post belongs to the “I’d like to see someone else write about this” genre. In other words, I am writing it with the hope that it will stimulate someone to explore the matter further in the form of a class paper, conference paper, or article. In short, I think it would make an interesting project to compare what Francis Watson and Christoph Markschies say about Clement of Alexandria’s ‘canon’ in Gospel Writing and Christian Theology and its Institutions in the Early Roman Empire with a view to the place assigned to Clement in their overall conceptions. As an invitation to explore this topic further, I have chosen one quotation relating to a specific point that they interpret differently and one quotation that sheds light on how Clement fits within their overall conception. And I’ve now added an extra quotation from Markus Bockmuehl for good measure! Markschies (CTaiI, 240-41): “If one reviews the citations from this writing in Clement of Alexandria, then it is conspicuous that Clement hardly has a detailed knowledge of the content of this text and thus evidently has not even read it in its entirety: φέρεται δέ, οἶμαι, ἐν τῷ κατ’ Αἰγυπτίους εὐαγγελίῳ; “But (these words) stand, so I believe, in the Gospel of the Egyptians”. Markschies (KcTuiI, 271): “Mustert man nun die Zitate aus dieser Schrift bei Clemens Alexandrinus, so fällt auf, daß Clemens kaum näher kennt und ihn daher offensichtlich gar nicht zur Gänze gelesen hat: φέρεται δέ, οἶμαι, ἐν τῷ κατ’ Αἰγυπτίους εὐαγγελίῳ; “(Diese Worte) stehen aber, wie ich glaube, im Ägypterevangelium”. Bockmuehl (Ancient Apocryphal Gospels, 211): “Clement’s awareness and use of at least excerpts of the text necessitates a date before the 190s, but it is difficult to be more specific. Because every one of Clement’s eight quotations from this work expresses the theme of a distinctly ascetical hostility to sexuality and procreation, he himself may only have known this work in the form of a thematic (and possibly already antiheretical?) collection of such excerpts, rather than as now preserved. (Cf. similarly Markschies 2012d, 666, 672). Watson (GW, 435-436): Clement’s citational practice represents a moment of transition between the earlier nonspecific appeal to “the gospel” and the emergence of four “gospels” differentiated by the names of their purported authors. Yet there is no consciousness of innovation in his single Irenaeus-like reference to “the four gospels handed down to us,” nor is it explained how this “handing down” has taken place or how it differentiates one set of gospel texts from others. One factor may simply be relative familiarity… As ever some books achieve a wide circulation whereas others are known only within limited circles or areas. If, hypothetically, two gospel texts are popular in Alexandria whereas only one of them is known in Rome, then the consensus about the one will seem to give it an ecclesial sanction that the other lacks. The fourfold gospel is an attempt to articulate, formalize, and enforce a convergence around a common usage. Clement himself articulates this perceived convergence, but shows no interest in formalizing or enforcing it. Indeed, he refers to it only in passing and in a single passage that does not reflect his citation practice as a whole. Nevertheless, an emerging trend may retrospectively be identified in this single passage, especially if we look back at Clement and his contemporaries from the perspective of Eusebius, the first great historian of the Christian canon. Markschies (CTuiI, 245; cf. 246): We can now summarize our observations on Clement of Alexandria: it can scarcely be disputed that this highly educated free teacher used a ‘canon,’ a normed collection of authoritative biblical texts, as the corpus from which he derived his fundamental axioms. Therefore, it appears to be precisely not the case that Clement represents a vague concept of the biblical and New Testament ‘canon.’ Rather, he deals in a relatively great scope with divinely inspired writings but distinguishes once more from these a narrower ‘canon’ of especially inspired biblical texts. One should not designate such a concept of graded canonicity as “vague” but exactly the opposite, as particularly considered. Markschies (KcTuiI, 276; cf. 277): Nun können wir unsere Beobachtungen zu Clemens Alexandrinus zusammenfassen: Es läßt sich schwer bestreiten, daß dieser hoch gebildete freie Lehrer einen ‘Kanon’, eine normierte Sammlung autoritativer biblischer Texte als dasjenige Corpus nutzte, dem er seine fundamentalen Axiome entnahm. Es scheint daher gerade nicht so, daß Clemens ein vages Konzept des biblischen und neutestamentlichen ‘Kanons’ vertritt, sondern einerseits in relativ großem Umfang mit göttlich inspirierten Schriften rechnet, davon aber noch einmal einen engeren ‘Kanon’ besonders inspirierter biblischer Texte unterscheidet. Ein solches Konzept gestufter Kanonizität sollte man nicht als “vage”, sondern gerade im Gegenteil als besonders reflektiert bezeichnen. For my other Watsonposts, see here. For my other Markschiesposts, see here. 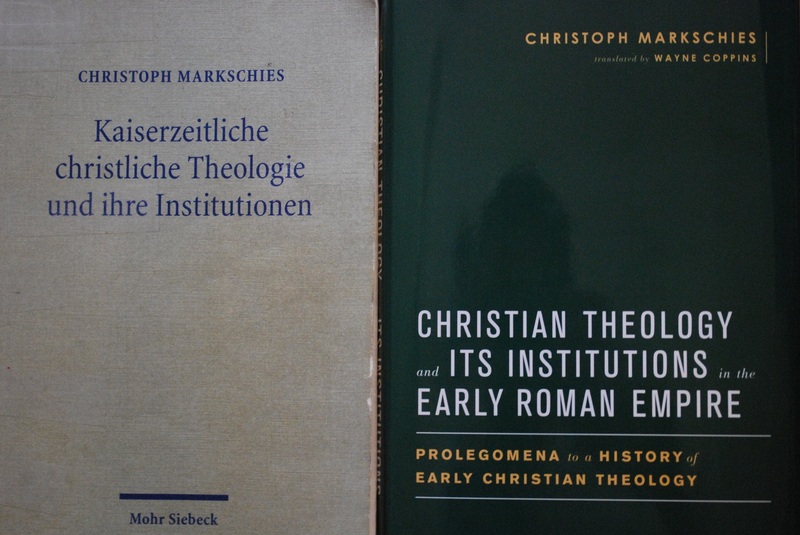 In a previous Law-Markschies-Origen post, I mentioned how much I had profited from reading T Michael Law’s book When God Spoke Greek in conjunction with my work translating Jens Schröter’s book Von Jesus zum Neuen Testament / From Jesus to the New Testament and Christoph Markschies’ book Kaiserzeitliche christliche Theologie und ihre Institutionen / Christian Theology and its Institutions in the Early Roman Empire, and I conveyed then my desire to devote a few more posts to a comparison of these works on select points. Continuing that discussion, this post will compare how these three works treat the question of the dating and character of the Muratorian Fragment. On the question of how to cite the Muratorian Fragment, see now SBL Handbook of Style Blog. Selective grammatical analysis: In translating “gehe ich hier nicht ein”, it seemed preferable to use the future with a view to English style. Likewise, “deal with” seemed to read better than “go into” in this case. Instead of “established itself” the verb “durchgesetzt” could alternatively be translated as “prevailed”. Selective grammatical analysis: Instead of translating “Bei dem … Text … es geht um” as “In/With/In the case of … the text … it is a matter of/the concern is with/we are dealing with” I have adopted the simplifying translation “The text … is …” (for further discussion of the translation of Es geht um see here). The difficult phrase “nur schwer zu verbinden ist” has the force of “can be linked only with great difficulty”. I am uncertain how to translate “Wie man auch immer optiert”, but “Whatever option one settles on” is perhaps more precise than “whatever one decides”. Although the German version has “die zur Zurückhaltung mahnen, die … oder von …”, I have translated “oder” with “and” with a view to English style and repeated “on those” in order to clarify the sense. For me, it seems that there are two points to draw from this post. First, while it seems to be the case that the majority of scholars continue to favor an early date for the Muratorian Fragment (ca. 180-200), it would probably go too far to speak of a “consensus” in relation to this point, since Sundberg, Hahnemann, T Michael Law, and other scholars have advocated a later date for this text. Secondly, and perhaps more importantly, the debate about the dating of the text should not be allowed to overshadow a second point of (perhaps greater and more significant) uncertainty, namely the uncertainty surrounding the classification of the genre or form of the text, which, due to its fragmentary character, arguably should not be classified too quickly as a “canon list”, which is not to say that this possibility should be ruled out too quickly either. For other posts/links relating to the Muratorian canon, see e.g., Bart Ehrmann, C. E. Hill, Larry Hurtado, Michael Kruger. Like many other readers (see e.g., here; cf. here), I profited from and enjoyed T. Michael Law’s important book When God Spoke Greek (cf. here). In the tradition of the “Man with the Honeyed Sword” (and Cicero), it is certainly a work that teaches, delights, and persuades, and I found that it constructively shaped my thinking at numerous points. Moreover, I found that it generated many lines of questioning as I read it in conjunction with my work translating Jens Schröter’s book Von Jesus zum Neuen Testament / From Jesus to the New Testament and Christoph Markschies’ book Kaiserzeitliche christliche Theologie und ihre Institutionen / Christian Theology and its Institutions in the Early Roman Empire, especially in relation to the topic of canon. Accordingly, I hope that this will be the first of several posts devoted to a comparison of these works on select points. For a recent conversation between T Michael Law and Christoph Markschies at Marginalia, see here. Today’s post will focus on a noteworthy difference in how Origen’s activity in Caesarea is presented by Law and Markschies. Note 7: See also H. Crouzel, Origène (Paris: Lethielleux, 1985), 46. “wohl” can be a somewhat elusive term, but it often has the force of “probably”. “übersiedeln” becomes “siedelt … über”. “weltlich” is difficult to translate, since both “worldly” and “secular” have their drawbacks. I have chosen to translate “eine ‘Hoch-(Schule)’” as “a ‘(collegiate) school’”, which is far from ideal but is probably the best that I can manage. I often translate “vor allem” with “above all”, though “especially” is better in some contexts. I struggled to translate “bildungswillige”, eventually choosing “keen on education”, and I decided not to repeat “keen on education” with Christians and Christian youth but to place the phrases in such a way that “keen on education” would be seen to modify both words. For the translation of “warb um” (past form of “werben um”) I debated between “sought to win”, “recruited”, “wooed”, and “courted” before settling on the last option. I find the phrase “unter christlichen Vorzeichen” and the similar phrase “unter dem Vorzeichen + genitive” to be very difficult. “Vorzeichen” can mean “sign” or “auspices”, which may be relevant here. “Unter dem Vorzeichen” seems to be able to have the force of “under the conditions of”. Hence, it might capture the force to translate the phrase as “under Christian conditions”. But I have chosen the formulation “within a Christian framework”, which I think captures the basic sense. While great caution is required when attempting to comment on an issue that lies outside of one’s sphere of expertise (in my case Origen scholarship), it remains possible to provide a tentative analysis in such cases, provided one remains acutely aware of the limitations of one’s competency. With this caveat in mind, let me restrict myself to two points. First, in relation to the specific point in question it would arguably not be unreasonable to give greater weight to the view of Markschies, since this question falls more directly within his specific sphere of research expertise and since he deals with this question at much greater length in his book. At the same time, one should resist the temptation to settle the issue too quickly, since Law interacts carefully with Origen in his book and can reference H. Crouzel’s book on Origen in support of his view on the matter at hand. Secondly, it therefore follows that any attempt to reach an informed judgment on the issue cannot be based solely on a general assessment of relative authority, but must critically test the strength of Christoph Markschies’ more extensive argument, which is based on his close reading of Gregory Thaumaturgus’s Address of Thanksgiving to Origen. Since my knowledge of this work and the critical issues that would need to be addressed as part of its analysis —which might include issues of authorship and historical accuracy— is extremely limited, I am not in position to test this argument with any authority. Instead, I can only say that an initial reading of the Address of Thanksgiving to Origen would seem to support Christoph Markschies’ argument that Origen established a relatively advanced Christian (collegiate) school, or private Christian university, in Caesarea, which would, in turn, appear to stand in considerable tension with Law’s statement that “In contrast to his previous tenure at the Catechetical School in the philosophically rich context of Alexandria, he found himself in contact less with students than with common Christians” in Caesarea. In other words, if Markschies’ argument is correct, then this may be a place in which minor revision will be required for the second edition of T. Michael Law’s important work When God Spoke Greek.